The world around is us changing: Brexit, the election of Trump and the ever increasing promises of technological development. 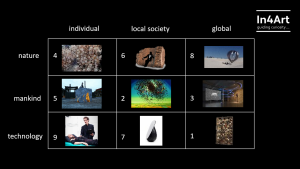 Forces that result in new roles and relationships between individuals and society, technology and nature. We are entering a new paradigm shift in which we will undergo a “Revolution of Being”. Revolution: a forcible overthrow of a government or social order, in favour of a new system, an instance of revolving (turn), a dramatic and wide-reaching change in conditions, attitudes, or operation. -> in this we read the strength of metamorphosis and the prospectus to break away from the routines we slowly grew into. -> this shows that something happens – A force towards flexibility, since we will continuously change. Habitat: natural surrounding (home or environment) of an animal, plant, or other organism. -> Making us wonder, what defines natural? We added a third definition, because the “Revolution of Being” is taking place in a certain Habitat of which artist Jakob de Jonge made a painting. This physical item helps to create experiences and is used in this context as a platform to discuss the intersection between reality and imagination and explore the relationship between nature, mankind and technology. It shows us the tensions and contrasts in a seemingly impossible triangle. Art can bring us news from the future and change how we experience the world. Artists have the flexibility to experiment, while the rest of us are captured in routines and patterns, bearing the consequences of the inflexibility of our ideology. All artists have made choices to emphasize of leave out items, resulting in their perspective which helps us questioning and raising consciousness of the time we are living in. To talk through the different perspectives and trends, In4Art developed a three folded framework visualised by the triangle in the work “Habitat”. We investigated the impact of technological change and found several dynamics. Various disciplines have to co-exist and battle for attention. Not meaning that one is replacing the other or that they naturally collaborate, but they are existent. Somehow these dynamics are pulling and forming us into a new state of being – a Revolution of Being. At the same time, we see that this triangle format has a resonance in practice; like the ‘golden’ triangle in which government, knowledge and business cooperate within the Dutch system. Therefore the framework is built up in various triangle stories. What are the dynamics forming both separate and connected triangles? Nature, technology and mankind (y-axes). Status Quo (1,2,3), Current Trend (circular (bio-based) economy) (4,5,6) and Future Prospects (7,8,9) through exploration, research and extrapolation (z-axes). In4Art completed the matrix with the stories of 9 European based artists. Our guests were artist designer Lonneke Gordijn co-founder of Studio Drift and visual artist and human rights professional Jakob de Jonge. The other stories were told by In4Art during the Features talk show on November 10th, 2016 in The Hague commissioned by the MINT programma Provincie Zuid Holland. Proudly we present beneath trailer made by artist Ermi van Oers and studio Radijs based on In4Art Features: Revolution of Being. Next we will tap into the 3 x 3 = 9 different stories in our grid. We experience a physical revolution of being due to a changing society. The society acts as the glue keeping nature, mankind and technology linked. In the work of Sergey Pasukhin the past technological development and progress is visualised resulting in the waste of humanity. The 20th century archaeology shows us our increased hunger and strive for smarter technology to support all facets of our lives. It depicts the materialistic consequence and global impact underneath our feet. Although it looks randomly placed, each object tells a story. All components, every object and material, has been carefully chosen to form a symbol of its time. It makes us wonder: what will stay with us for eternity? And at the same time makes us aware of our consumption greed and impact it imposes on the surface. Relating to impact, the works ”Turmoil” and “Information Warfare” of Jakob de Jonge show the impact on the position of mankind in our society in a physical way (migration) and in a digital way (internet). It makes us wonder: when do borders blur? Alicja Kwade just puts you in the centre of the universe by literally having the stars move around you, getting rid of all boundaries. Having so many possibilities to connect around us, there is a global force of 6 billion ”centres of the universe” that shape the larger network in which we see no difference whether you are an artist, entrepreneur or employee. Our time is landmarked by different trends, enabled by the exponential growth of technologies or through social, political or geographical pressure. An apparent one, which should be adhered to value our resources and planet earth, is stimulating the circular bio-based economy. There are beautiful examples on how an individual can work and learn from nature, while producing technologically advanced work. If a picture and the 1000 words of the story behind it unite, a beautiful representation is formed. Therefore, we ask 4 extra minutes of your time to watch the video about the work ”Fragile Future” from Studio Drift. The project can be seen as a critical yet utopian vision on the future of our planet, where two seemingly opposite evolutions have made a pact to survive. The labour-intensive process of collecting, LED connecting and reassembling of the daffodil is a clear statement against mass production and throwaway culture. It gave Lonneke Gordijn from Studio Drift the opportunity to closely learn from nature resulting in a vision around waste and spills. The basis is the belief that there is no waste and the materials to make your product can be found close by – just open your eyes and ask the right questions. Artist David Rickard shows that the local community is a source of raw materials. In 2016 Rickard realized the work ‘Yield’ in Belval in southwestern Luxembourg. This area was the site of major steel mills dominated until production fell idle. The new Belval is a large redevelopment project (120 football fields) in search of a new identity and meeting places. Rickard was asked to make such a meeting place, for which he came up with a surprising approach: embracing the community as a contemporary collective resource and inverting the presumption that aluminium is a foreign substance. He showed that the material is all around us and gave the inhabitants value for their work: a yield on the art work. After a defined period the work will pass to the next step in the value stream and transform from art again into raw material: given back to the inhabitants of Belval. Another way is to ‘manipulate’ nature. Or actually you could put it like joining forces- creating symbioses for the better of both. Why stop the natural process to make something mechanically, while we can learn nature to make the product we want? Artist Maarten Baas and bio-designer Gavin Munro are working on this concept on the short and long term: they let the trees do the work of growing into products for everyday use, like furniture. The first collaborated with the Groninger Museum and placed a chair cast pressing into a big tree in the museum garden. In 200 years the tree will grow enough to have let the cast do its work and form the Tree Trunk Chair. The latter takes on a much more viable route following the same reasoning with the Full-Grown project. The production of a full grown chair on his farm takes 4 to 8 years by training the tree to grow into ready-made products. The ‘current’ production process requires tree to be at least 10 years old to have the wood strong enough to fabricate products from it, while creating residue. As humans we are nurtured to find solutions. We manipulate nature and come up with technological solutions to ease our need. Every time we want to reach for more, better or faster. This quest of bringing us to the next level result in endeavours that are thought provoking. Studio Drift took the artificial twin of natural material obsidian (better known as lava glass) and created art objects with it, like mirrors. However, there is a deeper meaning. They are putting a mirror to society: how do we cope with our materials? The synthetic material obsidian in their Obsidian Project is a safe way to capture chemical waste, resulting in a material with huge potential in construction and waste management. These artists want to create physical impact from an ethical responsibility to deal with the increasing landfills of heavy metals, hospital waste and chemicals (all together labelled as chemical waste): a poignant increasing threat in today’s vulnerable world. Another option is to use nature as a driving force. Currently we use fossil fuels and technology like batteries or solar cells for transportation. Tomas Saraceno seeks in his work for new, sustainable ways of living and traveling by solemnly using the power of nature to its full potential. This challenges us to think in a different way. The Aero Scene project developed a floating sculpture, a kind of balloon, which is completely emission-free flying around the world. And that is happening now. No use of fossil fuels, solar panels or batteries. No helium or other gases. The sheer force of the wind and the heat of the sun. The artist sees his work also as prototypes rather than works of art, which blurs the dividing line between tech start-up and artist. There is only one problem to solve even before this could be our new way of traveling: The Aero Scene cannot bear more than 3 kilos of weight yet. The digital revolution provokes new trends and influences the way we move and use our body. The third option is imagining the consequence of a successful implementation of these technological solutions. What if robots will take over all of our manual labour? Combine this with the thinking and calculating capacity of artificial intelligence, which we expect to surplus our mind in the near future, what will then be left for us as humans? Will we become obsolete? Artist Manuel Beltrán already founded the “Institute of Human Obsolescene” and introduced ‘Speculative Capital’. Manuel said: “To cope with a labour market dominated by machines we must re-adapt the position of humans in society”. If we will become obsolete on the physical and mental front, we still have our body to generate heat: embrace biological labour. We can us our body heat as a precious energy source to power the engines that will do the bitcoin mining for us. It does sound like getting rich while sleeping, an interesting thought. Above artists have ideas that are so revolutionary and progressive that the question will be whether it stays fiction or if we are already on the path towards reality. Our ambition was to broadcast various stories about the “Revolution of Being”. Everything is in a continuous change: adapting or reacting on the reality or anticipating a belief: panta rhei. We will not draw conclusions or outline scenarios. The art works show pictures of possible destinations, not how to get there. We hope that the visualization and rendering of ideas might inspire and create appreciation to how we will form our “Revolution of Being”. This session was realized with the support of the MINT Programma (Maatschappelijke Impact Nieuwe Technologie) Provincie Zuid Holland and held during the Festival van de Toekomst on November 10th, 2016 in The Hague. As of December 12th you can watch the special movie made on this show by artist Ermi van Oers and Studio Radijs. The supporting slides of this talk show can be found here.